Eurasia is the region that is seriously lagging behind in terms of food policy research in both domestic and international research programs, - said Andras Horvai, Country Director and Resident Representative for the Russian Federation, The World Bank, in his opening remarks. After the collapse of the Soviet Union, the newly independent republics in Central Asia and South Caucuses either did not inherit the policy research capacity, or the capacity that remained was not suitable for the new economic reality, continued Mr. Horvai. As a result, food policy research in the region has long been dependent on government capacities, or on recommendations from external sources, mostly through donor programs. Context specific knowledge required to deal effectively with domestic crises, caused both by climate or economic shocks, is still often missing or is in very short supply in the Eurasian countries. United by the goal to improve this situation, the Eurasian Center for Food Security (ECFS) at the Lomonosov Moscow State University, the World Bank, and the International Food Policy Research Institute (IFPRI) with financial support from the Ministry of Finance of the Russian Federation have been working together to build the much needed research and analytical capacity in the region. The collaboration between the ECFS and the World Bank started in 2011, when the Center was established. In 2014, at a conference in Bishkek, Kyrgyzstan, IFPRI launched the Central Asia Research and Capacity Strengthening Program, implemented in partnership with the ECFS, the University of Central Asia (UCA), other research institutions in the region, and in collaboration with two IFPRI-led CGIAR research programs: Agriculture for Nutrition and Health (A4NH) and Policies, Institutions, and Markets (PIM). As part of the program, local researchers work together with colleagues from IFPRI, ECFS, and other organizations to analyze relevant issues pertinent to food security and nutrition in the region, co-author research publications and present them at local and international fora, and participate in various capacity building events organized by the partners. Studies presented by Dr. Roman Mogilevskii (Kyrgyzstan), Dr. Parviz Khakimov (Tajikistan), and Dr. Bakhrom Mirkasimov (Uzbekistan) during this latest conference in Moscow are result of this collaboration. Annual conferences and workshops organized under this collaboration bring together representatives of research, development, and policymaking communities in the region, creating an opportune space for discussing food security, food safety, and nutrition research priorities for the Eurasian region. International partners and invited speakers add global perspective to the regional agenda. 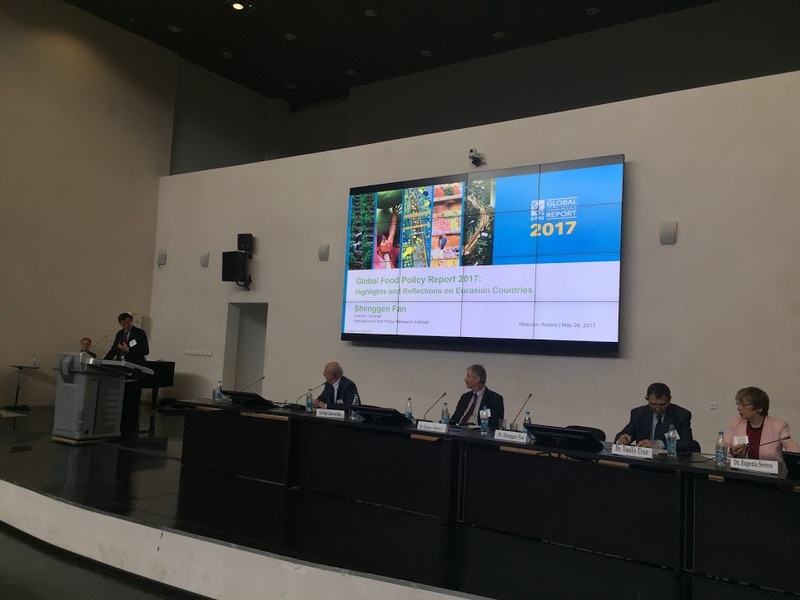 The Moscow conference featured IFPRI’s 2017 Global Food Policy Report presented by the Institute’s Director General Shenggen Fan. One of IFPRI’s flagship publications, this year it looks at the impact of rapid urban growth on food security and nutrition, and considers how food systems can be reshaped to benefit both urban and rural populations. The report also provides a regional perspective on developments in Central Asia, which includes analysis on the impact of economic slowdowns, crop diversification, and the role of regional economic integration on food security, health, and poverty in the region (see Dr. Fan's presentation here). Dr. Eugenia Serova, Director of the FAO Liaison Office with the Russian Federation, praised the report and stressed the importance of the urbanization issues for the region and globally. She discussed the topic with examples for Russia in her presentation. She also welcomed the conference’s focus on migration, another key topic for the global sustainable development, and for the Eurasian region specifically. Dr. Serova reminded, that the World Food Day (October 16) this year will be dedicated to migration, reflecting its highest relevance to the global food security. 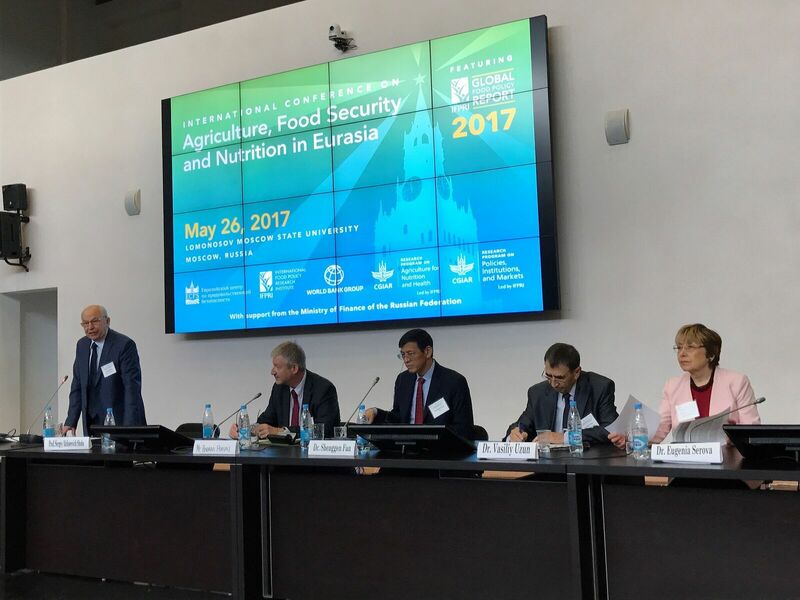 The afternoon sessions of the conference were dedicated to the discussion of priorities for policy research to improve food security and nutrition in Eurasia. Prof. 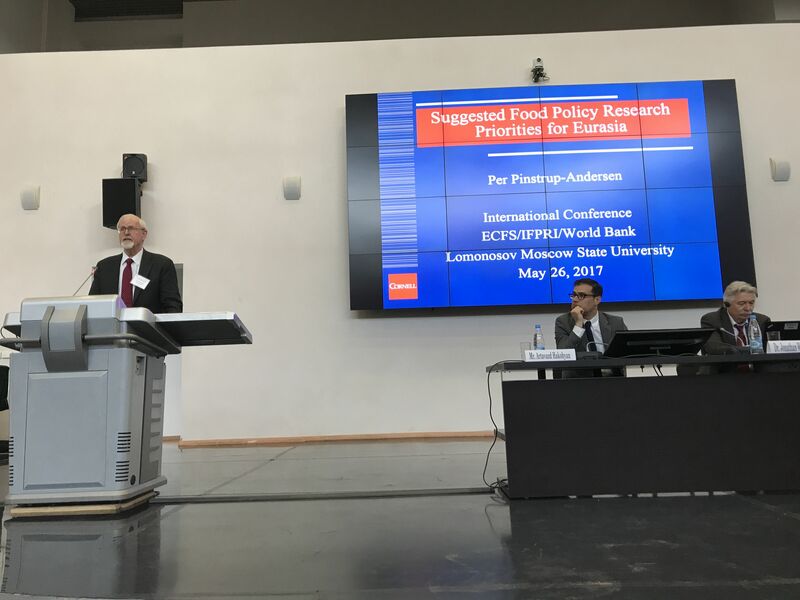 Per Pinstrup-Andersen (Cornell University, USA) presented key points from his recent report “Suggested Priorities for Policy Research to Improve Food Security and Nutrition in Eurasia” published by the Eurasian Center for Food Security and The World Bank. He particularly stressed that the report did not intend to make recommendations about priority policy action, but instead it attempted to identify important knowledge gaps for which new policy research was needed. He suggested 17 suggested topics (of high, medium, and low priority) organized into four sets of challenges and opportunities: (1) Improving the diets; (2) Meeting future food demands, enhancing agricultural incomes, improving national, regional and international supply chains; (3) Sustainab ly managing natural resources; and (4) Managing risks and uncertainty. (See the report and the presentation for more details). Presentation by Dr. Jonathan Wadsworth (The World Bank) on the CGIAR reform and its implication for the international food policy research in Eurasia highlighted the importance of better collaboration and information sharing among various actors in the region. Mr. Erkinbek Choduev, vice-minister of agriculture, food manufacturing industry, and amelioration of the Kyrgyz Republic, presented the policymakers’ perspective on the challenges and opportunities for the food policy research in the country. Mr. Rakhim Oshakbaev, Director of the Applied Research Center “Talap” based in Astana, Kazakhstan, discussed the challenges and issues pertinent to agricultural development and food policy research within Eurasian Economic Union. The next event on food security and nutrition in the Eurasian region organized by the partners will be held on October 3-5, 2017, in Dushanbe, Tajikistan. See more information here. Registration will open soon, you can express your interest to participate here.